Although the bathroom is close to being functional, it will probably be a work in progress for a bit longer – hence the 1.0 designation. Aside from all the accessories I need to add, I’m still not sure about the shower. Because I had to raise the shower on a platform due to the interior discharge plumbing, the 20″ combined height of the tub and platform makes it difficult to get into. What I’d really like to find is a 30″ diameter tub that’s only 6″ high, with little to no slope on the sides. I’ll probably end up having to make one myself someday out of epoxy coated wood. In the meantime, it’s at least functional. The platform is constructed of 2″x6″ cedar boards with stainless steel screws holding it together. The vertical support boards are cut out along the back wall to make room for the plumbing, which runs from under the kitchen cabinets to the shower platform. The tub is a Behrens 35 gallon galvanized steel tub that I got from Amazon, of all places. I cut a hole in the center, recessed the perimeter of it a bit with a punch and hammer, then epoxied a threaded drain into it. The HepvO waterless drain waste valve screws into the threaded drain and runs horizontally to the the main drain pipe. Without the HepvO valve, I don’t know how I would have been able keep the shower trap indoors. The other big advantage to these, as I mentioned in a previous post, is that they are self winterizing. Here’s a look at the plumbing behind the scenes. I’ve got to say it took some time to figure out how to fit this under the kitchen cabinets and shower, allowing for the requisite 1/4″ per foot slope. 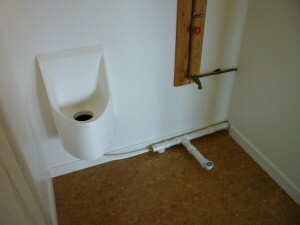 The urinal is plumbed to the drain with flexible PEX tubing attached to quick connect/disconnect SharkBite fittings. 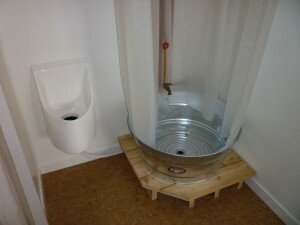 An added bonus with this setup is that the tub and urinal can both be disconnected and removed in a matter of minutes without any tools. And before anyone asks why the plumbing can’t go behind the walls, there’s a structural steel post between the containers and directly behind the drywall that prevents it – such are the challenges of container construction. 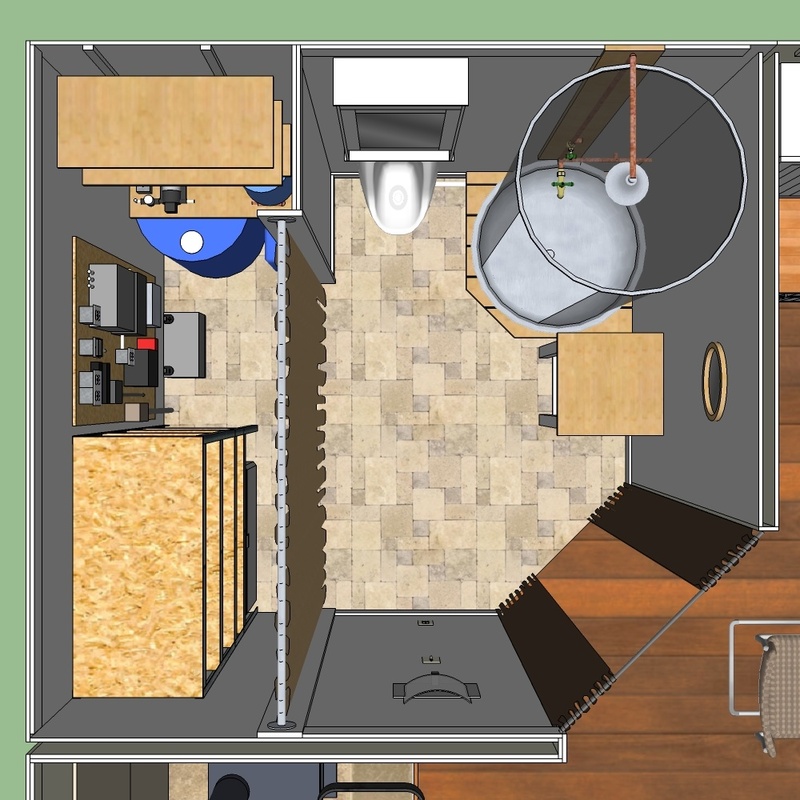 It’s rather difficult to take pictures inside such a small place and be able to see everything, so I’ve included an overhead layout of the bathroom from SketchUp. This shows the main bathroom area and the “utility closet” for general storage and the electrical and water systems. The shower leaves room for improvement. Perhaps the 30″ tub will help. I am surprised at the urinal. I believe I read earlier that you are married. I would think a toilet would have been more apropriate for the wife. The men should not be opposed to the great outdoors. With grandparents living on the farm, we kids, learned to use the coffe can on the cold winter nights. As I said in my last post, I knew the urinal would be controversial. Practically speaking, the cabin is occupied by men (my sons and my male friends) about 90% of the time. For the few times that my wife will come along, I do have a small portable toilet she can use. 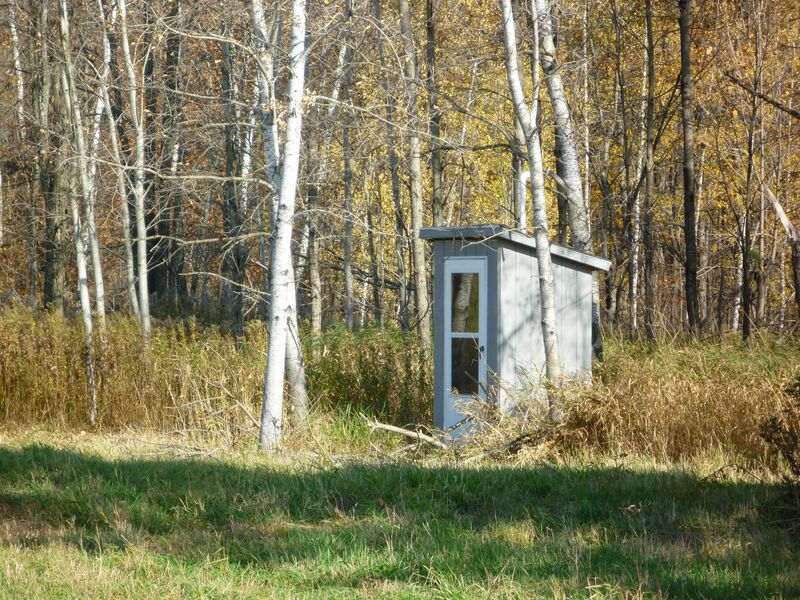 For everyone’s other needs, I have a very nice outhouse as shown below. As a guy, I could probably have done without even a urinal in the cabin, but those middle of the night bathroom breaks during deer season when it’s 0 degrees outside are tough. Having a real toilet in the cabin would be nice, but not so nice that I’m willing to pay $15K for a legal mound septic system. If I were ever going to live up there full time, which I really can’t imagine happening, I would probably just build myself a sawdust toilet. BTW, there is a way for women to use a urinal using one of these. Hello, love the site…I am curious why you didn’t put the containers on a more raised platform and put all plumbing (and potentially composting toilet) underneath? Too expensive, not worth it? My containers are already about 3 feet off the ground on concrete walls, so I’m not sure how much more of a raised platform you envision. And while I could easily place a composting toilet system under the cabin, I would never want to do so. Most small cabin users are moving away from the larger composting toilets and are instead using indoor self contained models such as the Loveable Loo and Nature’s Head. Yes as a women a toilet is nessecary. We are going for a small house, the bathroom looks doable and I think the glavanized tub is fun. -with a rubber olug in the bottom my grandkids would love to take a bath in it. As a mom of 5 boys & 2 girls tree watering is typical solution to a grid locked bathroom. But even as a man you do required a toilet once in a while. About the galvenized bottom pan: most are made with a slight draft angle so that they stack easily for shipping and storage. To see what is readily available (cheap) just visit a farm or tractor supply type of place where even black plastic is common. My shower is outdoors and consists of a cedar plank platform with 1/2″ spacing and some gravel fill beneath. I’ve showered at 100F and at 16F…I was a lot faster at 16F!! I use a 12V RV water pump and my car jump starter battery pack plus a 5 gal black plastic bucket. In the summer there is no need to heat the water I use solar…in the winter I heat it on the wood stove in a stainless bucket then mix it up and use it outdoors. Works for both me and the (now ex) wife. We have a standard pit outhouse. My shower is a tiootal investment of about $40 for the pump and clear 1/2″ plastic hose. Good luck. You could also cut the top or bottom of a blue water barrel. Straight sides and whatever height you want. I thought about that once, but the appearance and 24″ diameter eliminated it. I’d prefer it to be 30″-32″ wide. I’ll probably end up making my own out of wood someday. 25 years ago, when my wife and I were building in rural Indiana, we first built a gaarage in which we lived. 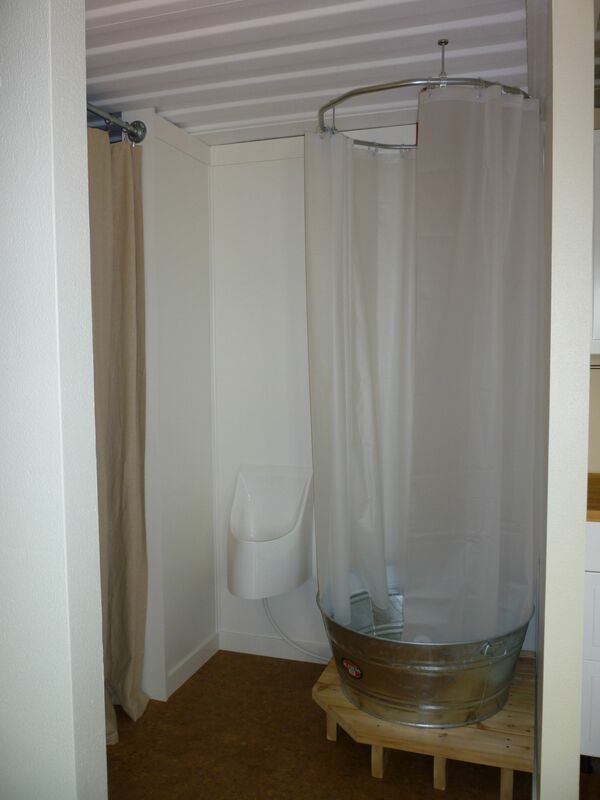 We utilized a shower stall, on top of a platform such as you built. I then built a platform about 6′ high above the shower floor (we’re short). On top of that platform we would place a 5 gal. plastic bag which had a hose with a spay nozzle. We used that for a couple of winters, until we got the house built. Also a note on the outhouse. A sheet of foam insulation with a seat hole cut in works great on cold winter nights. Just lift the foam off the seat if you use standing. Your little cabin looks awesome…I’m totally bookmarking your blog for future small home ideas for us! How do you have the water set up to drain on the exterior? The drain pipe goes straight down through the container floor, then down 2 1/2 feet through the open “crawlspace” under the cabin, then about 2 feet underground. From there it heads west about 15 feet into a drywell. I hope to have some pictures of the drywell up in a week or so. I have used a fiberglass kitchen sink, and tubs in my home… Look into an acrylic, mini claw foot tub since you have limited space. The children will love it, the small people will enjoy it and the tall people need only to stand up in it. You will love it since you can have easy access to do any plumbing maintenance to the claw foot tub. Look in to this as well the shower floor. My favorite is a soap stone or acrylic shower floor, My neighbor installed a soap stone shower floor in 2004 and it looks just as new with every day use. The soap stone is very expensive and may be difficult to do plumbing maintenance but it is a beautiful stone, and an acrylic or soap stone shower floor can be custom manufacture for your limited shower space. …I have installed fiberglass tubs 15 years ago in my home, and with everyday use, I need to refinish them every two years! Where as if you do not use the cabin everyday, and because of the inexpensive price of a fiberglass tub or fiberglass shower floor, it may seem the correct way to go. Just remember that fiberglass tubs or shower floors has a thin layer of enamel paint which easily scratches. I would stay away from a fiberglass bath tub, and shower floor. Found a link to this site, which is very nice done by the way, on a website called freecabinporn.com. Yes I know it sounds funny, maybe you put it there, but my friends are leery to click on that website when I tell them about it. I read your blog from start to finish at work, didn’t get much accomplished at work, but I learned A LOT! Thanks for taking the time to post all the work you have put into this. I have some land and if I can ever finish my honey-do list, will do this very same project one day. The wife and I had a good laugh about the shewee! Ok, you have a place to pee. I don’t see a place to do a number 2. 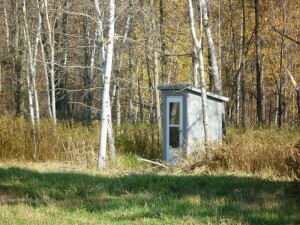 Did you not notice my awesome outhouse as you were scrolling down? Haven’t seen any activity in some time. What’s happening? If you finished the cabin, how aboout a pictorial tour? I’m still around, it’s just that I haven’t done any real work for a while. Sometimes it’s nice to just hang out at the cabin and not do anything. My plans for the summer are to finish the interior trim, improve the bathroom, drill a well or install a cistern, and possibly install another container for storage. As soon as I do something interesting, I’ll post it. I lived in a container for two years. I used a composting toilet, which worked great. I also purchased a shower stall from the local home store for about $70. I installed it with it sitting on concrete blocks above the floor. This left enough room under the shower stall for a plastic pan that caught the water and then I would dump it out the door. I heated the water over the small woodburning stove and used a camping shower that was battery operated to have the shower actually work like a shower. The camping shower was less than twenty dollars. 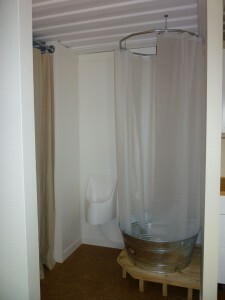 When not in use as a shower, it was a good storage area. A few years ago I converted large bus into a motorhome and faced most of the same problems that shipping containers present. I used reinforced tygon for plumbing because it is easy to fix in the field with hose clamps and fittings. RV and marine sources supplied 12 v demand pumps and a free standing shower stall from the building supply for $75 worked fine. Loop the tubing and you have a simple trap. You can also consider a stock tank from the farm supply store. They come in a variety of sizes. My bus kept me occupied for 7 years of my retirement. I’m looking forward to a much quicker container project. why would you need a trap for shower/tub if you have no sewer gas to avoid? Even greywater, especially that from kitchen sinks, has organic material that will decompose. I’d rather not have that odor filling up my cabin, especially one as air tight as mine. i am wanting to construct a 2×40 foot container house in an area that has city water and sewer. any tips on how i can get the plumbing and wiring engineered to meet code? i suspect i will have to find an architect, but am hoping to do a lot of the work myself. also, how much interior space did you loose insulating? mine will be built in NM, so insulation is a top priority. don’t want to bake. love your blog, wish more had helpful, hands on advice instead of just pix. Since plumbing and electrical codes vary wildly between states, and even local communities, there’s not much that I can help you with here. Your best bet would be to hire, and/or consult with, local professionals. In regards to interior space lost, my finished interior is about 420 square feet out of an exterior footprint of 480 square feet. There’s a fair amount of loss with containers due to the corrugated walls, doors on one end, and other miscellaneous structural remnants. My estimate for two 40′ containers would be about 575 square feet of finished space. Probably as important as insulation in NM would be shade for the containers. I would recommend a metal roof with LOTS of airflow underneath it and enough overhang to keep the sun from reaching the container in summer. I have three feet of overhang on my roof, and it’s done a great job keeping my cabin cool in the summer. With all the unescorted visitors you have, I’m surprised you haven’t installed some of the motion detector cameras on the market. They may take enough pictures to identify who it is order to prosecute for trespassing and theft. Otherwise, a good idea and apparently inspiring to others. Thank you so much for sharing your adventure. Inspiring to say the least and you have shared a lot of great ideas and clearly demonstrated them with this awesome site. I love the concept of the stock tub as a shower. How has it worked for you? Do you think (space allowed) if you added a larger platform say 1′ longer than the tub, that it would make it easier to climb in via a step? The shower works good in my opinion. The only issue I have with it is that it doesn’t drain completely and needs to be wiped dry after use. The height is also not a problem for me as I’m 6′ 2″, but I do have a small step stool nearby if needed. I still consider this a temporary solution and will probably build a custom shower enclosure sometime in the future.